The most fabulous way to explore the natural beauty of the Mamanuca and Yasawa Islands is aboard Captain Cook Cruise lines Reef Escape (Dro ki Cakau). You will explore pristine beaches and remote islands with palm fringed villages. Bask in warm lagoons, savour the bounty of the lovo feast, dance to the drums of the meke, and sleep to the sound of surf on a distant reef. 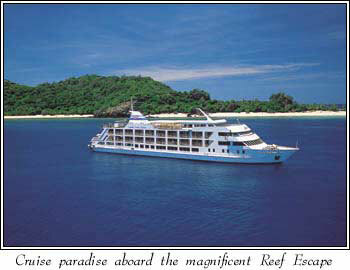 Aboard Reef Escape (Dro ki Cakau) the crew will show you the real Fiji on a voyage for just 120 priveleged guests. 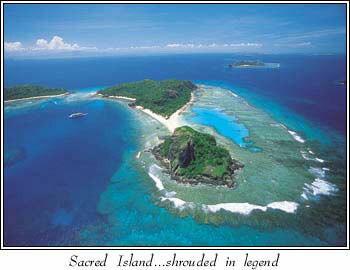 The Fiji Archipelago has more than 330 islands scattered across 230,000 square kilometers. The exotic Mamanuca and Yasawa Islands lie to the north west of Nadi, the international gateway to Fiji. It's a breathtakingly beautiful cruising passage through hundreds of tropical volcanic islands and spectacular coral gardens. An ancient culture, rich in myth and legend, the Fijian lifestyle is beautiful in its simplicity. Visit timeless villages, untouched by 20th Century technology and experience the unique local customs and ceremonies. Cruise to remote and exclusive destinations including the legendary Sawa-i-lau limestone caves and the Sacred Island of Vanua levu, the birthplace of Fijian culture. Each day Reef Escape (Dro ki Cakau) cruises for just a few short hours, with leisurely days spent enjoying the spectacular islands. You will be delighted with the warm, personalized service of the friendly Fijian crew and captivated by their beautiful island music. Custom crafted, the ship has four elegantly appointed passenger decks, all open onto the outside deck with a choice of sunny and shady retreats. 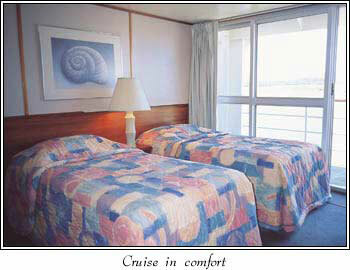 All cabins and staterooms feature private suites with floor to ceiling windows opening onto the outside deck. The spacious public areas give you total freedom to escape with a tall glass and a good book or enjoy the convivial company in the roomy lounge and bars. On deck, there is a swimming pool, chart house, pool bar and plenty of sun lounges for hours of total relaxation. Inside, Reef Escape (Dro ki Cakau) offers an elegantly appointed lounge with cocktail bar and baby grand piano, dining saloon, reef room with conference and video facilities, spa, sauna, library, gift shop and 24 hour self service coffee bar. By day, the dining saloon offers sumptuous breakfasts and luncheons combining international fare with the exotic tastes of Fiji. In the evening, enjoy superb three course table hotel dining with a different menu every night prepared by international chefs. After dinner, there is a unique blend of cultural and international entertainment, including traditional island dances and music. The Captain's Dinner is the gala event with music, dancing and romance under the stars. To fully experience the spectacular coral reefs and marine life, there is a glass bottom boat, snorkeling, dive equipment, onboard Dive Master and an embarkation platform with a lift from the water level to the main deck. Captain Cook Cruises invites you to explore the islands of Fiji the way it was meant to be discovered, by sea! Reef Escape sails every Saturday and Tuesday from Denarau Marina. Captain Cook Cruises has specially designed two unique cruises which, when combined equal seven glorious nights, (in any order you choose) the two cruises offer the ultimate Fiji voyage. For those with limited time, the three night or four night cruise can be taken individually as the ultimate Fiji escape or as part of your extended touring holiday.